She stands a mere five feet tall, but don't let her tiny stature fool you, Kellie Rucker is a very BIG talent. Over the course of a career that has spanned more than 20 years, she has appeared on the bill with such legends as Dizzy Gillespie, Stephen Stills, Albert Collins, James Cotton, ZZ Top, Dan Hicks, Warren Zevon, Little Feat and B.B. King. Her tone-heavy harmonica and powerful singing voice have made her a key ingredient in recordings and live shows of legendary blues guitarist and Grammy nominee, Jon Butcher. Her work can also be found on discs by such diverse artists as Coco Montoya, L.A. Guns, Corey Stevens and B.B. Chung King and the Screaming Buddaheads and on TV, radio and other music sessions. Born in Oklahoma City, Rucker and her family moved often, making stops in Texas, Virginia and the Florida Keys before settling in Mystic, CT. Following in her brother Robby’s footsteps, she took up the harmonica at the age of twelve. As a teenager she had the habit of sneaking into blues clubs to see influential performances by Johnny Winter, James Cotton, James Montgomery, and Roomful of Blues. At age seventeen, she headed west to Denver, where she formed her first blues band, Blues for Breakfast. She loved the Rocky Mountains, but longed for the warmth of the Southeast and returned to the Florida Keys. There she happened to join forces with the Bill Blue Band, with whom she eventually toured in Scandinavia. Following the Swedish tour, Rucker came to Southern California and settled briefly in the San Diego scene before migrating north to Los Angeles, where she met Coco Montoya and Albert Collins' guitarist Debbie Davies. She and Davies formed a band that toured extensively along the 'left coast' for over two years. As her harmonica playing evolved, Rucker began to feel limited by her role in a traditional blues band and she sought to expand her musical horizons. She caught the attention of noted electric blues guitarist, B.B. Chung King, and after sitting in a few times was invited to join his band, The Screaming Buddaheads. She recorded and toured with BBCK for over five years, throughout Japan, Canada and the US and since then has become a sought after 'gun-for-hire’. If Kellie Rucker was a biscuit, the list of musical ingredients would include a bowlful of Blues, a pinch of Zydeco, a teaspoon of Swing, a half-cup of Country, a little Bluegrass and a dash of Soul Music! - for inspiration, she listens more to guitar and Hammond B3 players than harp players. When asked who she would be if she could inhabit the body of her biggest artist influence, she says she would be a combination of Al Green and Mick Jagger! In addition to 'Ain't Hit Bottom' Kellie has recently completed her second CD project, ‘Church of Texas’ and is now working on material for CD number three! Watch for Kellie is busy touring the world playing music, so watch for her out there! She's one talent you won't want to miss! When Homer told the tale of the sailors attracted to their fate by the sirens singing, he certainly had something like this CD in mind. Kellie Rucker makes me stop in my tracks and get closer to the speakers. Shame over the music-industry to ignore such a great arist like Kellie Rucker! Great Girl , great songs, great voice! Kellie Rucker is perhaps one of this country's best kept secrets, but shouldn't be. Her CD Ain't Hit Bottom is, in short, awesome. Kellie anchors this well-produced CD with drop-dead gorgeous, gritty vocals and a mean blues harp. While other artists make good contributions, it's Kellie who takes center stage and a commanding ownership all 11 tunes. Even the photo of Kellie on the front of the CD invites you to listen, which you will do many times. Kellie's low bluesy voice is a cross between Bonnie Raitt and "Mothers Ruckers" own addictive one. Listen once, then listen again. You won't turn it off. Don't miss this small packages BIG harmonica riffs. Oh, she writes some catchy lyrics and plays guitar too. I only hope she come up with another one soon. I am jazzed to hear a female harmonica player! As a rookie harmonica lady this CD is an inspiration to me. Bed of Lies is my favorite,that is if I have to pick one. Blues is Blues grabs the heart strings and speaks volumes of truth. You just gotta get this baby it'll rock your world. 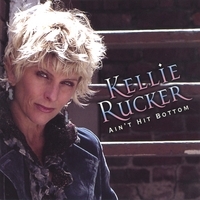 KELLIE RUCKER "Ain't hit buttom"
Ecxellent CD. Very class, a good feeling, lovely voice and a way of playing harmonica which is very interesting.